Frankensteinia: The Frankenstein Blog: The Frankenstein of 1826, in Color! The Frankenstein of 1826, in Color! A lithograph from an 1826 Paris performance reveals actor T.P.Cooke as Frankenstein's Monster, in color! Cooke originated the role in London, July 1823, in Richard Brinsley Peake’s Presumption, or The Fate of Frankenstein, to phenomenal success. Within weeks, five different copycat plays sprang up, all featuring monsters based on Cooke’s interpretation. Mary Shelley herself, attending a performance on August 28, came away delighted with the play and Cooke’s performance. Dressed in a short tunic, wrapped in a loose cloak, barefoot, fright-wigged and sporting a blue-green complexion, Cooke would be the inspiration, the template, the model for all the theatrical Frankenstein Monsters for nearly a century, just as Boris Karloff’s blockhead and bolts version has been an icon and a reference over the last 80 years. 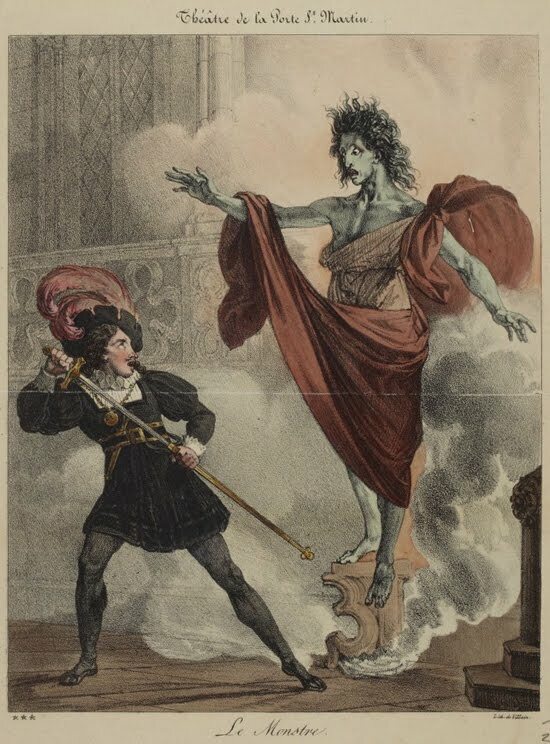 A measure of his notoriety, Cooke, though hobbled by gout, was called to Paris in 1826 for Le Monstre et le magicien, a new play inspired not by Mary Shelley’s novel but by Peake’s play, as were all of the Frankenstein plays — more than a dozen by now — staged in England, all over Europe and in America. Save for the basic theme of an artificial man and the dire consequences for his presumptive creator, very little of Shelley’s work remained. The Monster and the Magician’s authors, Antony Beraud and Jean-Toussaint Merle, even did away with the Frankenstein name. Here, the creator was called Zametti. In a scene lifted intact from the Peake play, The Monster, brought to life offstage, bursts out of the mezzanine laboratory in a cloud of smoke. He crashes through a balustrade and drops to the stage, confronting Frankenstein, snatching away his sword and snapping it in two. The same scene was first illustrated in 1823 (posted here), showing Cooke in a signature heroic pose. The scene was also used to illustrate Peake’s book of the play (posted here), with The Monster appearing as a baby-faced giant. 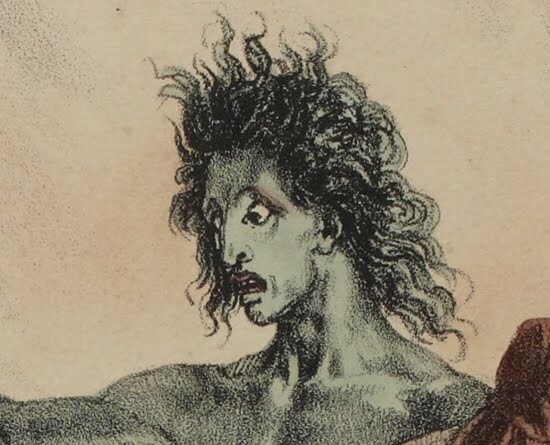 In the 1826 illustration above, for the first time, Cooke appears in makeup, with full-body blue-green paint, red mouth and red highlights across the eyebrows. The Monster’s color was variously described by contemporary critics as blue or green. One version of the play was called The Blue Demon. Cooke was such a sensation in Paris that his makeup color was replicated on gloves and dresses, with newspapers as far away as New Zealand reporting that the season’s fashionable color was vert de monstre — Monster Green! The art is by François LeVillain — not to be confused with a famous namesake who was a sculptor and medal engraver — a lithographer of renown who was at the peak of his powers in the 1820s. LeVillain’s spectacular illustration, by far the most dynamic representation of the creation scene, is filled with tension as Cooke’s Monster hovers like an Angel of Death over the Frankenstein character, Zametti, pulling his sword. Note the composition, with the flowing robe mirroring Zametti’s arching pose and feathered hat. Note the textured smoke, the beautifully rendered folds in The Monster’s costume, and the delicate, muted colors. This remarkable illustration, unlike any other, reveals the original stage Monster’s true appearance. The illustration is archived on the French National Library’s Digital Library site, Gallica. I'll be posting more images from the 1826 play over this coming week. This is great! And I'm really looking forward to seeing more of these. As much as I love Karloff and the Universal Frankenstein, the ubiquity of that version of the monster is sometimes frustrating. It sometimes seems as if the Frankenstein story didn't exist in popular culture between the publishing of the novel and the release of the first film in 1931. I'm really curious as to how the creature was depicted during that "forgotten" century.